Wikipedia handily translates into English and Gaelic. 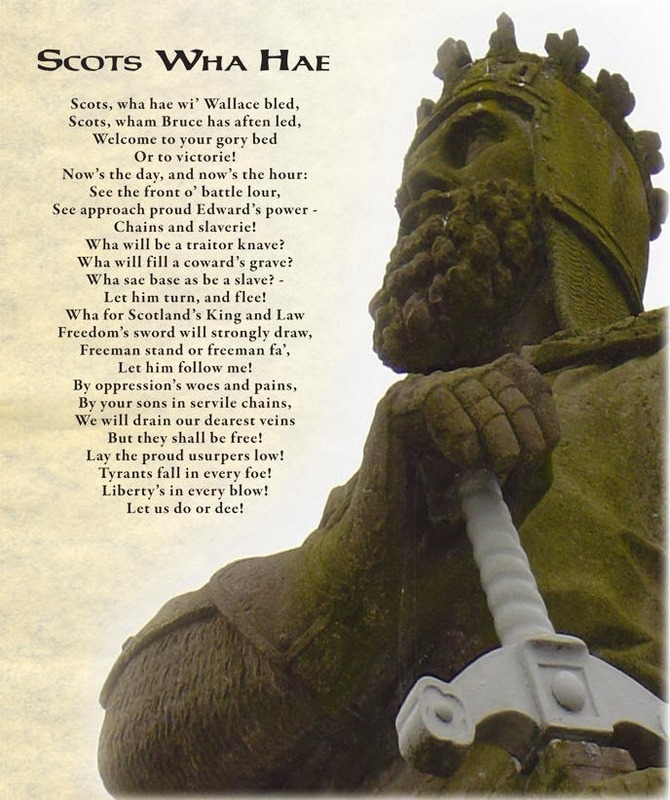 Most Scots, and I'm sure a fair good few non-Scots, know about this auld sang, but for those that don't: "Robert Bruce's March to Bannockburn," known more commonly as "Scots Wha Hae," was written by Scotland's most celebrated poet Robert Burns in 1793. Though the speech itself is conjectural, it was written to the tune of "Hey Tuttie Tati," a traditional Scottish tune of ancient lineage, which was widely believed to have been played by the Scottish troops at Bannockburn. That’s why I yearn for the days of the early frontier, where men were more truly free than at any other time or place in the history of the world, since man first began to draw unto himself the self-forged chains of civilization. This is merely a personal feeling. I make no attempt to advocate a single ideal of personal liberty as the one goal of progress and culture. But by God, I demand freedom for myself. And if I can’t have it, I’d rather be dead. I had been neglecting my tributes to favourite authors for a while, but there would really be something wrong if I failed to observe the birthday of Robert E. Howard - not least because he, more than any other, gave me a channel for the passion I have for writing. 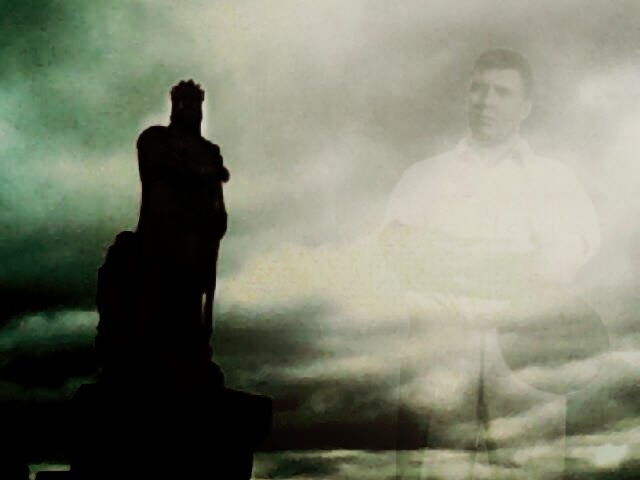 Bannockburn is permeated with Robert E. Howard. It isn't a pastiche, nor is it an imitation, but I'd like to think the impact of his historical and fantasy fiction on my creative mind would be, if not present, then at least acknowledged as a major influence - in particular "The Grey God Passes," of course, but also the Bran Mak Morn stories, "Delenda Est," "People of the Dark," and plenty more. More consciously, it occurred to me how much of Bannockburn echoed elements of "The Hour of the Dragon." At first I thought it coincidental, but then I recalled the suggestion that much of Conan's journey in that story echoed the tale of Robert the Bruce himself. This has been brought up a number of times in Howard studies, but speaking in my position as a True Scotsman, I definitely support this hypothesis. Consider: both are popular kings "elected" by the people to lead, after slaying their rivals by their own hand. Both are offered a position of vassalage to the invaders, which they reject not only from pride, but in the knowledge that the people would reject them and drive them out as the enemy. Both are driven from their country into the wild, where only a handful of brave supporters aid them as they cross the countryside to foreign lands in search of direction. Both (are said to have) come to revelations in dark caves. Both return with renewed purpose after their exile and search for answers, and engage in guerilla warfare, before a final confrontation in which their forces are outnumbered by their enemy - but in stronger positions. Both are aided by the timely intervention of the common people, abused and downtrodden by enemies from home and abroad, who were not ordered, but chose to fight for their own freedom. I guess, then, it's just natural I would include a mysterious wise woman who may be more than she seems, people from distant lands who aid both sides in the struggle, a nightmare lord of undeath who has come to claim what he believes his birthright, women who remain defiant despite intolerable cruelty and humiliation, and monsters & sorceries beyond the ken of man. But then again, these elements are common to Scottish culture as well as in Howard's 20th-century translations of the Nemedian Chronicles, and since Howard was a great fan of Scottish authors Sir Walter Scott & Arthur Conan Doyle - not to mention the history of the British Isles - it's perhaps inevitable one could make allusions between "The Hour of the Dragon" and Scottish culture. Zelata bears similarities to the Cailleach Bheur, she who is as part of the wilds as the wolf and bird-of-prey, as well as the many legendary Scottish witches & wise women. Albiona's defiance and determination to die rather than submit reflects the bravery of Countess Isabella MacDuff. The stalwart Pallantides is to Conan as "the Guid" Sir James Douglas was to the Bruce, while the proud Trocero of the semi-autonomous realm of Poitain echoes Aonghas Óg of the semi-autonomous Lordship of the Isles. The aid offered to Conan by the outcast priests of Asura is not unlike legends of the excommunicated Knights Templar offering their secret aid to the Bruce's cause. There's even tales of a Scottish wizard, Michael Scott, roughly contemporaneous with the Wars of Independence, who wore "the oriental costume generally worn by the astrologers of the times" - not unlike the star-and-moon robes Xaltotun was given. Rest assured, though, this won't be just "The Hour of the Dragon" with a coat of Scottish paint. For one thing, the main character will not be the Bruce, but a lowly peasant of the "Sma' Folk" who finally won the battle. Even so, rather than consciously try to mimic or diverge from my influences, I will be happy enough to simply try to make a good story which reflects what I'm trying to do. It's the best way to pay tribute to both men of the name Robert. I suppose I might as well talk 2013/2014. In 2013, I gained the confidence to embark on my new career and made measurable steps to that end. I made many new friends, caught up with faraway pals, and met some old ones I haven't seen in decades. I contributed voluntary work and tried to give a lot to the community, vital in this current climate. I had my first stall where I exhibited my art, and proved to myself I'm not uniquely unsuited to being an artist. It was tough, too. There's been a lot of upheaval, some pretty profound effects on my personal life. Lots of heartache, turmoil, anger, sorrow, strife, and confusion. Friendships have been sorely tested, family relationships strained, even things like handling finances have taken a toll. Sometimes I wondered how we were going to get past some of those hurdles. Some of those hurdles are still there. And I see others yet uncrossed. 2014 will be one of the most important years of my life, on the grand and the modest scale. Grand because of the most important referendum in my country's history which will determine its future and that of my family and friends and their children. Modest, because it will be the year where I finally evolve as an artist and professional. Perhaps I'll never feel like I'm a "proper" artist, but now I've learned that I won't let that stop me from trying. I'm looking to release the first issue of Bannockburn in April, before the other great 2014 anniversary: if it isn't released by then, then certainly as a single issue for June. Depending on whether I feel satisfied with the story I wrote or not, perhaps I will revisit it in the future: plenty of authors adapted short stories into novels, after all. I'll also continue writing on the blog when the fancy takes me, hopefully with more regularity (every week at least). I've had a nasty habit of not writing anything for ages, then vomiting up 5,000-word essays. That said, I have a backlog of posts which I'll do the finishing touches on. I also plan on embarking upon the 5th Scottish Invasion of Cross Plains (and hopefully actually finishing the posts on the 4th invasion, jings, Al) and my 3rd trip to the Arizona Comic-Con. Maybe I'll bring some copies of Bannockburn over for my New World pals! Until then, best of luck, one and all, for 2014.